Archos' first Android tablet, the Archos 5, didn't quite live up to its promises,but a second leaked Android tablet from the French could prove more feature-some if realized, with a front-facing webcam and new 7-inch size. Thanks to a slip-up by the UK retailer Data-Mind, we've got photos and specs of the tablet, which will apparently go on sale in March for £149.99 ($242). It'll have 8GB of onboard storage, a webcam, and 7-inch LCD screen with 800 x 480 pixels. 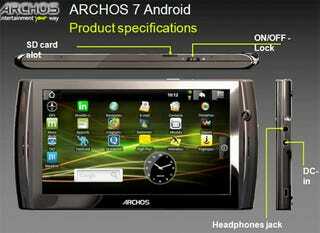 That's 2.2-inches more than the Archos 5, with the storage being the same. It's not just hardware which will be upgraded between the models, with the software being upgraded too. Song lyrics support, and compatibility for the APE file format will be included, and ArchosFans, which were eagle-eyed enough to spot the leaked product, are speculating about the missing Archos Media Center widget from the homescreen.